Is the CBO Playing Politics? it assumes that everything unfolds as if current law stays in effect forever. Everyone understands that this is a fantasy. 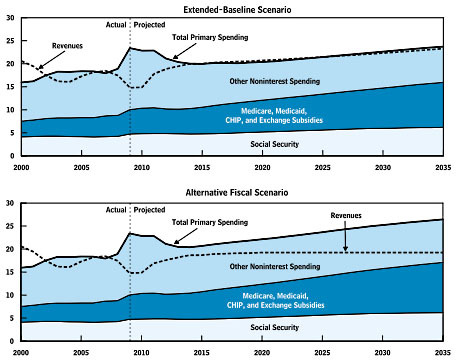 So they also have an “alternative scenario.” If, for example, Congress “fixes” the alternative minimum tax every year without fail, then CBO assumes it will continue doing this even if Congress never permanently changes the underlying law. Ditto for several other things that Congress tends to deal with on an ad hoc basis every year. The alternative baseline is now based on judgments about the strength of the doctors’ lobby and about the configuration of American rent-seeking politics rather than being merely an attempt to construct an honest baseline. It’s not clear to me that CBO has the expertise to make such judgments. It is clear to me that if it is going to make them, it needs to back them up much more comprehensively than it has done. The CBO does itself a disservice if it starts getting too heavily involved in political calculations like this. They’ve already made their best estimates about what effect healthcare reform will have on the federal budget, and if they want to change those estimates they should do so openly. But simply assuming that a future Congress will kill all cost savings measures with no special evidence to back that up? That’s just not their job. CBO is supposed to be an honest broker, not a Washington Post op-ed columnist.